Poured resin is naturally a very flat surface, highly durable under vehicle tyres, and resistant to wet weather conditions, making it perfect for an outdoor car park surface. It can be used on ramps without any problems, which means a seamless transition between different multi-storey levels and a consistent driving experience. Create a professional, welcoming driving surface that will not damage customers’ tyres. • Use high contrast colours for better visibility in dark areas like basement car parks and at night. • Seamless transitions on and off of multi-storey ramps with no jarring as vehicles enter the ramp. • Demarcation and epoxy paint line markings highlight parking bays and direction arrows. Resin is perfectly suited to use outdoors, but there are some aspects of your car parks surface that you might want to give extra attention. For example, a thicker resin layer can be more robust – a good option for exposed car parks and the top deck of a multi-storey car park. Aggregates can provide extra grip in the resin mixture, and again this may be sensible for exposed levels and for pedestrian walkways. Our surface preparation process will help to improve the bond between the resin and the floor sub-surface – we provide all of the equipment needed for this, and carry out the work with no clean-up required. Once the floor is cleaned and roughened up, it is ready for the resin to be poured and left to dry – any necessary epoxy paint line markings can then be added, and your new car park is ready to use. We install elastomeric waterproof systems for exposed levels which prevents water ingress within the car park structure and in turn protects your structure from damage caused by corrosion and expensive on going maintenance costs. The internal levels do not normally require a waterproof membrane unless built over residential or retail premises. Therefore the car parks surface is essential to prevent leakage into the rooms or structures below. 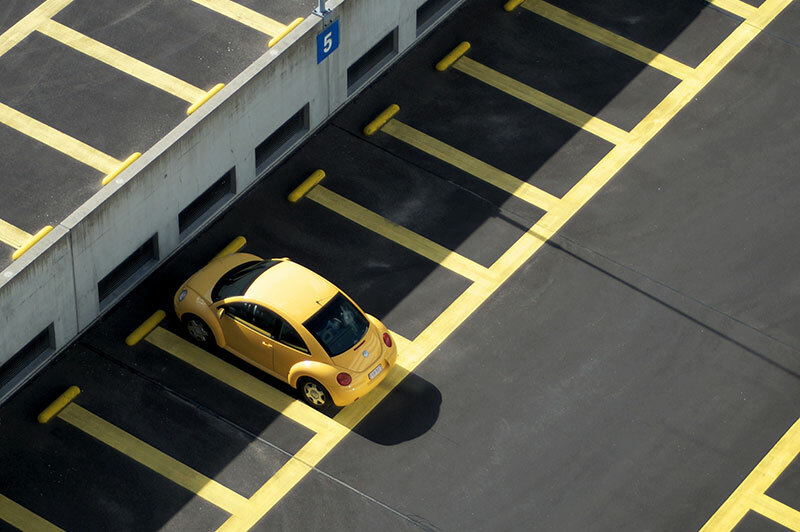 Normal internal car park levels can be decked with colour coded car park flooring to ensure traffic and walking routes are identified as well as distinctive car park spaces. The installed resin surface within car parks meet British standard slip resistance under wet or dry conditions. We also understand that speed may be vital when installing car park decking and waterproofing in your establishments. Therefore one of the most popular choices from our clients is an MMA resin floor system. The system thickness and specification remains the same however the technology of this resin results in the floor being fully cured for traffic after two hours from our finish and handover. Contact us to learn more. We are happy to build you a bespoke solution they can meet budget constraints yet conforms to your expectations.